The U.S. Senate confirmed the following ambassador nominations on Wednesday, September 28. Five nominations included in SFRC’s business meeting on September 27 did not make it to the full Senate vote (see bottom list). About 17 other ambassador nominations and FS lists are currently pending in committee and do not have scheduled hearings as of this writing. The following nomination and FS lists were in the agenda of the Senate Foreign Relations Committee but appear not to make it through the full Senate vote. Note that the hyperlinked lists are those posted in the Senate’s Executive Calendar. Joseph R. Donovan Jr., a career member of the Foreign Service, Class of Minister-Counselor, is Managing Director of the Washington Office of the American Institute in Taiwan, a position he has held since 2014. Previously, Mr. Donovan served as Foreign Policy Advisor to the Chairman of the Joint Chiefs of Staff at the Pentagon from 2012 to 2014, Associate Professor at the National Defense University in Washington, D.C. from 2011 to 2012, and Principal Deputy Assistant Secretary in the Bureau of East Asian and Pacific Affairs at the Department of State from 2009 to 2011. He was the U.S. Consul General in Hong Kong from 2008 to 2009, Deputy Chief of Mission at the U.S. Embassy in Tokyo, Japan from 2005 to 2008, and Director of the Department of State’s Office of Chinese and Mongolian Affairs from 2003 to 2005. Prior to that, Mr. Donovan was Political Section Chief at the Taipei Office of the American Institute in Taiwan from 2000 to 2003 and Political/Military Unit Chief at the U.S. Embassy in Tokyo, Japan from 1997 to 2000.Earlier assignments in the Foreign Service include posts in Taiwan, China, South Korea and Qatar.Before joining the Foreign Service, he served as a Peace Corps Volunteer in Seoul, South Korea. Mr. Donovan received a B.S.F.S. from Georgetown University’s School of Foreign Service and an M.A. from the U.S. Naval Postgraduate School. If confirmed, Mr. Donovan would succeed career diplomat, Robert O. Blake, Jr. who was appointed ambassador to Jakarta on July 30, 2013. The U.S. Ambassador to Indonesia Robert O. Blake visited Papua and the North Maluku early this year with stops in Ternate, Manokwari, Nabire and Jayapura. We saw the photos and we recognize that this is Indonesia but have to idea where exactly these places are located. According to Wikipedia: The Maluku Islands formed a single province since Indonesian independence until 1999, when it was split into two provinces. A new province, North Maluku, incorporates the area between Morotai and Sula, with the arc of islands from Buru and Seram to Wetar remaining within the existing Maluku Province. North Maluku is predominantly Muslim and its capital is Sofifi on Halmahera island. Maluku province has a larger Christian population and its capital is Ambon. Between 1999 and 2002, conflict between Muslims and Christians killed thousands and displaced half a million people. Here are some more photos from the rest of that trip. 1/2 a mile or so from US embassy on one of Jakarta's busiest/fanciest thoroughfares. Sarinah Plaza a symbol of US in Jakarta since 1980s. American embassies hold Fourth of July festivities every year. This blog has followed those official celebrations through the last several years. There is brewing controversy over the news that the U.S. Embassy in Jakarta had moved its Fourth of July celebration to June 4th this year to “avoid any conflict with the month-long Ramadan celebration.” Makes perfect sense to us. Before you get all mad, read on. So yes, our diplomatic posts overseas have moved these independence day celebrations due to heat, monsoon weather, and now, Ramadan. And this is probably not the first time an embassy has done this, and it will not be the last. Ramadan this year begins the evening of June 17 and ends the evening of July 17. During this time, many Muslims will observe a pre-fast meal before dawn. At sunset, they will have their fast-breaking meal. On July 4th, in Muslim host countries like Indonesia, the red, white and blue cake will not be first on their minds when they break their fast for their first meal of the day since dawn. Here’s where we pause for a reminder that these Fourth of July celebrations are official functions typically hosted by our embassies for host country nationals and contacts. There is every need to accommodate local sensitivities and realities. Or there will be no one in attendance. But what about American citizens, you say; can’t they just party among themselves? They can for private celebrations, of course. But the diplomatic Fourth of July celebration has an official function and purpose, which is (like all representational functions), to provide for the proper representation of the United States, and further foreign policy objectives. Note that some documents are web-accessible but most are in pdf formats. On November 5, 2013, the U.S. Senate confirmed by unanimous vote Ambassador Robert O. Blake, Jr. as the Ambassador Extraordinary and Plenipotentiary of the United States of America to the Republic of Indonesia. Ambassador Robert Blake, a career member of the Senior Foreign Service, Class of Career-Minister, is Assistant Secretary of State for South Asian Affairs. Previously, he served as Ambassador to the Democratic Socialist Republic of Sri Lanka and the Republic of Maldives from 2006 to 2009. Prior to that, Ambassador Blake served as the Deputy Chief of Mission at the U.S. Embassy in New Delhi, India from 2003 to 2006. Previous domestic assignments include: Executive Assistant to the Under Secretary for Political Affairs from 2001 to 2003, Deputy Executive Secretary from 2000 to 2001, and the Turkey Desk Officer from 1998 to 2000. Overseas assignments include: Head of the Political Section at the U.S. Embassy Tunis, Tunisia from 1995 to 1998 and Economic Officer at the U.S. Embassy in Algiers, Algeria from 1993 to 1994. He received a B.A. from Harvard College and an M.A. from John Hopkins School of Advanced International Studies. Ambassador Blake is the son of retired Ambassador Robert O. Blake. 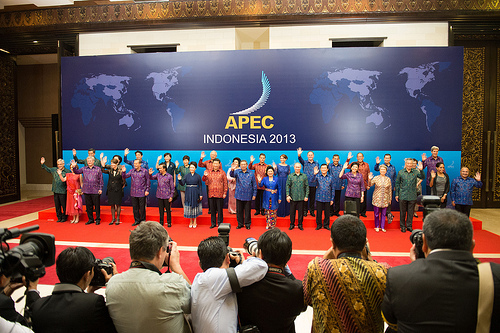 Indonesia will be his second ambassadorial posting. He succeeds Scot Marciel who became Principal Deputy Assistant Secretary at the EAP Bureau in August 2013, after serving for three years as U.S. Ambassador to the Republic of Indonesia. Indonesia is one of those posts in the Foreign Service where very few political appointees dare to go. 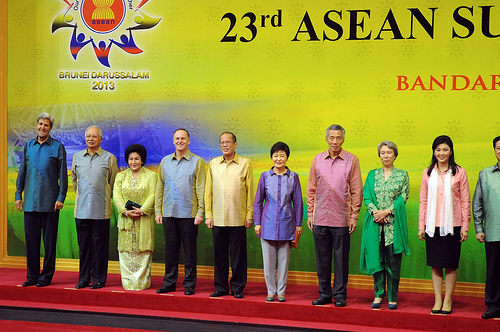 In fact, since the 1960, the WH has made 17 ambassadorial appointments to Jakarta. Of those appointments, only one was a political appointee, Paul D. Wolfowitz who served as ambassador there from 1986-1989. The cancellation of President Obama’s trip to Asia lent to hyperventilating descriptions about the president’s “Asia Pivot” — “falters,” “in shambles,” “goes pffft,” “in jeopardy” and such. Well, frankly, not sure where that is going. But we could certainly imagine the political hay that would have been expended over POTUS trip to Asia during a government shutdown. In any case, Secretary Kerry took the trip instead. Dear Congress, this is what happened to America in Bali, Indonesia. So you’re not allowed to make fun of that shirt or any other shirts, kapish? We actually think that purple batik suits him well. Had they asked him to put on a gray one, he would have worn it too, even if he would have looked wash out in it. Because he’s our top diplomat. 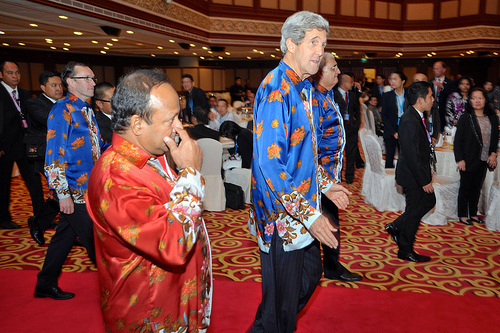 Yes, diplomats are known to wear (and eat) things that their compatriots often find strange or weird. (See Round-Up: Headgears in the Foreign Service). These are way tamer in comparison to what President Bush had to wear during his tenure. Unfortunately, Tropical Storm Nari caused the cancellation of Secretary Kerry’s trip to the Philippines, so we are missing Secretary Kerry wearing the country’s famous Barong Tagalog. Anyhow, we understand that Australia continues to host annual six-month training deployments of US Marines to its base in the Northern Territory. Australia’s Courier News reports today that Prime Minister Tony Abbott has promised the necessary infrastructure will be put in place to accommodate the expected presence of a 1000 U.S. Marines set to train there next year. The government is preparing to construct additional accommodations at two bases in Darwin. Then we heard that we are helping the Philippines develop Oyster Bay, a postcard-perfect cove on Palawan Island into a port for naval frigates and eventually for American warships? All, of course, overlooking the disputed South China Sea. But given all that’s happening in Washington, D.C…. “It was 11:00 pm. I offered our Chinese friends to raise a shot of vodka,” Mr Putin said, according to Russian state news agency ITAR-TASS. “They did not refuse, so we did just that.” As for the cake: “We wolfed it down successfully”. Needless to say, Mr Putin described his meeting with Mr Xi as “very warm” and “friendly”. We can’t say if Secretary Kerry was in attendance for that “quaffing” and “wolfing” event. The administration’s rebalance toward Asia has not been matched by additional financial or human resources. A Congressional Research Service memorandum notes that “[new] initiatives have not, however, been accompanied by a significant increase in the State Department or USAID’s programmatic resources devoted to East Asia.” Foreign assistance to the region in FY 2013 is 19 percent below the FY 2010 peak. U.S. military resources for the region have increased, but sequestration may impact future plans. Folks, somewhere, some heads of state are laughing their heads off. The State Department recently released its compilation of significant attacks against U.S. diplomatic facilities and personnel from 1998 to 2012. Below is the list of attacks in 2012 We have highlighted in red all attacks with death or injuries, including incidents where the casualties are non-Americans. JANUARY 1 TO DECEMBER 31 – IRAQ: Unknown individuals targeted the U.S. Consulate in Kirkuk with indirect-fire attacks on 41 separate occasions; additional indirect-fire attacks were launched against other U.S. interests in Iraq. *FEBRUARY 2, 2012 – BAMAKO, MALI: Demonstrators attacked a U.S. Embassy vehicle with stones while the vehicle was en route to evacuate Mission dependents from a local school. A second Embassy vehicle also was attacked in a different location. There were no injuries in either incident. FEBRUARY 20, 2012 – KANDAHAR PROVINCE, AFGHANISTAN: Unknown individuals attacked a U.S. Army convoy carrying one Embassy employee, killing one U.S. soldier and wounding two others. MARCH 2, 2012 – ADEN, YEMEN: A gunman fired three rounds into the side window of a U.S. Embassy vehicle. No one was hurt in the attack. MARCH 17, 2012 – FARYAB PROVINCE, AFGHANISTAN: Insurgents fired two rockets at the U.S. provincial reconstruction team compound. No injuries or damage were reported. MARCH 24, 2012 – URUZGAN PROVINCE, AFGHANISTAN: An explosive device detonated against a vehicle outside an entry control point of the U.S. provincial reconstruction team compound, killing four Afghan National Police officers and one local national. MARCH 26, 2012 – LASHKAR GAH, AFGHANISTAN: An individual dressed in an Afghan National Army uniform killed two International Security Assistance Force soldiers and wounded another at the main entry control point of the U.S. provincial reconstruction team compound. APRIL 12, 2012 – VALLEY OF THE APURIMAC, ENE, AND MANTARO RIVERS, PERU: Presumed members of Sendero Luminoso terrorist group fired on a U.S. government-owned helicopter, killing one Peruvian police officer and wounding the Peruvian crew chief. APRIL 15 TO 16, 2012 – KABUL, AFGHANISTAN: The U.S. Embassy compound sustained minor damage after heavily armed gunmen attacked several diplomatic missions and Afghan government buildings throughout the city. APRIL 16, 2012 – GHOR PROVINCE, AFGHANISTAN: Unknown individuals attacked a U.S. provincial reconstruction team compound with small-arms fire but caused no injuries. APRIL 16, 2012 – MANILA, PHILIPPINES: Protesters stole several letters from the sign at the Embassy front gate and threw paint onto the building. JUNE 6, 2012 – BENGHAZI, LIBYA: An explosive device detonated outside the U.S. Special Mission, leaving a large hole in the perimeter wall but causing no injuries. JUNE 16, 2012 – PAKTIKA PROVINCE, AFGHANISTAN: Unknown gunmen opened fire on a U.S. Embassy helicopter, striking the aircraft and rupturing its fuel tank, but causing no injuries. AUGUST 8, 2012 – ASADABAD CITY, AFGHANISTAN: Two suicide bombers detonated their explosives near U.S. provincial reconstruction team members walking near Forward Operating Base Fiaz, killing three U.S. service members and one USAID employee, and wounding nine U.S. soldiers, one U.S. diplomat, four local employees, and one Afghan National Army member. SEPTEMBER 3, 2012 – PESHAWAR, PAKISTAN: A suicide bomber in an explosives-laden vehicle attacked a U.S. Consulate General motorcade near the U.S. Consulate General’s housing complex, injuring two U.S. officials, two locally employed staff drivers, a local police bodyguard, and several other policemen providing security for the motorcade. SEPTEMBER 8, 2012 – ZABUL PROVINCE, AFGHANISTAN: The U.S. provincial reconstruction team was targeted with two improvised explosive devices, but suffered no injuries. SEPTEMBER 10, 2012 – BAGHDAD, IRAQ: Unknown individuals on the ground fired at a U.S. Embassy aircraft, but caused no damage to the aircraft and no injuries to those on board. SEPTEMBER 11, 2012 – JERUSALEM: A “flash-bang” device was thrown at the front door of an official U.S. Consulate General residence, damaging an exterior door and hallway, but causing no injuries. SEPTEMBER 11 TO 15, 2012 – CAIRO, EGYPT: Protesters overran U.S. Embassy perimeter defenses and entered the Embassy compound. No Americans were injured in the violent demonstrations that continued for four days. SEPTEMBER 11 TO 12, 2012 – BENGHAZI, LIBYA: Attackers used arson, small arms, machine guns, rocket-propelled grenades, and mortars against the U.S. Special Mission, a Mission annex, and U.S. personnel en route between both facilities, killing the U.S. ambassador to Libya and three other U.S. government personnel, wounding two U.S. personnel and three Libyan contract guards, and destroying both facilities. SEPTEMBER 12, 2012 – TUNIS, TUNISIA: Demonstrators, at the U.S. Embassy to protest inflammatory material posted on the Internet, threw stones at the compound’s fence and tried to get to the Embassy perimeter wall, before police secured the area. SEPTEMBER 13, 2012 – SANA’A, YEMEN: Protesters stormed the Embassy compound, looting property and setting several fires. No U.S. citizens were injured in the attack. Throughout the day, groups of protesters harassed the U.S. Embassy and a hotel where Embassy personnel were residing. SEPTEMBER 14, 2012 – CHENNAI, INDIA: Protesters outside the U.S. Consulate General threw a Molotov cocktail, causing some damage but no injuries. SEPTEMBER 14, 2012 – KHARTOUM, SUDAN: An angry mob threw rocks at the U.S. Embassy, cut the Mission’s local power supply, and used seized police equipment to battle the Embassy’s defenders, damaging more than 20 windows and destroying several security cameras. SEPTEMBER 14, 2012 – TUNIS, TUNISIA: Protesters breached the U.S. Embassy wall and caused significant damage to the motor pool, outlying buildings, and the chancery. Separately, unknown assailants destroyed the interior of the American Cooperative School. No U.S. citizens were injured in either attack. SEPTEMBER 16, 2012 – KARACHI, PAKISTAN: Protesters broke through police lines and threw rocks into the U.S. Consulate General perimeter, damaging some windows but causing no injuries. SEPTEMBER 17, 2012 – JAKARTA, INDONESIA: Demonstrators threw Molotov cocktails and other material at the U.S. Embassy to protest inflammatory material posted on the Internet, injuring 11 police officers and causing minor damage to the Embassy. SEPTEMBER 18, 2012 – BEIJING, CHINA: Protesters surrounded the U.S. ambassador’s vehicle and caused minor damage to the vehicle, but no injuries were reported. SEPTEMBER 18, 2012 – PESHAWAR, PAKISTAN: Demonstrators outside the U.S. Consulate threw rocks and Molotov cocktails, and pulled down a billboard showing a U.S. flag. SEPTEMBER 23, 2012 – LONDON, UNITED KINGDOM: During a demonstration by thousands of protesters outside the U.S. Embassy, an unknown individual threw a rock at the building, damaging a ballistic- resistant window. SEPTEMBER 27, 2012 – KOLKATA, INDIA: Protesters marched toward the American Center, rushed the gates, and threw sticks and stones at the facility, causing minor damage to a window. OCTOBER 1, 2012 – KANDAHAR PROVINCE, AFGHANISTAN: Unknown individuals opened fire on the U.S. provincial reconstruction team facility with small-arms fire, but caused no injuries. OCTOBER 4, 2012 – KANDAHAR PROVINCE, AFGHANISTAN:Unknown individuals targeted the U.S. provincial reconstruction team with small-arms fire, but caused no injuries. OCTOBER 11, 2012 – SANA’A, YEMEN: The U.S. Embassy’s senior foreign service national investigator was shot and killed in his vehicle by gunmen on a motorcycle. The terrorist group Al-Qaida in the Arabian Peninsula claimed responsibility for the attack. OCTOBER 13, 2012 – KANDAHAR PROVINCE, AFGHANISTAN: A suicide bomber detonated a suicide vest as a delegation of U.S. and Afghan officials arrived for a meeting, killing two U.S. citizens and five Afghan officials. OCTOBER 29, 2012 – TUNIS, TUNISIA: Two men in a car harassed and threw a can at a U.S. military officer assigned to the Embassy who was driving a vehicle with diplomatic license plates. The officer was not injured in the incident. NOVEMBER 4, 2012 – FARAH, AFGHANISTAN: An unknown individual attacked the U.S. provincial reconstruction team facility with a grenade but caused no injuries. NOVEMBER 18, 2012 – PESHAWAR, PAKISTAN: Two mortar rounds exploded near U.S. Consulate General housing, injuring one local guard and damaging the consul general’s residence with shrapnel. NOVEMBER 21, 2012 – JAKARTA, INDONESIA: Demonstrators, protesting inflammatory material posted on the Internet, threw objects at the U.S. Embassy. NOVEMBER 23, 2012 – MEDAN, INDONESIA: Demonstrators at the American Presence Post damaged a vehicle gate in an attempt to gain access to the ground floor of the building. NOVEMBER 23, 2012 – PESHAWAR, PAKISTAN: A round of indirect fire landed near a U.S. Consulate General residence but did not detonate and caused no injuries or damage. DECEMBER 4, 2012 – DHAKA, BANGLADESH: Demonstrators surrounded a U.S. Embassy vehicle on the road, attempted to set it afire, and threw rocks and bricks at it, shattering several windows and injuring the driver. DECEMBER 22, 2012 – TUNIS, TUNISIA: Protesters forced their way into the Ministry of Justice to confront a visiting delegation of U.S. government investigators. No one was hurt in the encounter, but photos of the U.S. investigators inside the Ministry of Justice were later posted on social media and other Internet sites. The complete list is accessible online here.